Richard Whichello’s playing background includes being British No 1 junior from the age of 10 to 18, winning a record 23 National Titles, as well as representing Great Britain in the Davis Cup and playing at the Wimbledon Championships, on several occasions. Richard was Kent Men’s captain from 1994-2008 where his team won notable National Titles. His most memorable experience was being Bjorn Borg's practice partner during his comeback. He enjoys working with all standards from beginner through to County and National level players. Richard is available for coaching at £30 per hour. Joint lessons for 2-4 people are £35 per hour. Half-hour lessons cost £17. Anna was a nationally ranked player in her native Poland and is an experienced coach of all standards of player. Anna shares her infectious enthusiasm for the game that ensures you have a fun lesson and can see immediate results from her coaching. Anna is a Level 3 coach and is working towards Level 4. She leads a number of adult/junior group coaching sessions and is available for private lessons £30 per hour. Joint lessons £35 per hour. Sharon Bowes is a Level 3 Club Coach and PGCE qualified teacher. Parent of former national level player. She has competed in ITF Seniors Competition and International Masters Olympic weightlifting. Sharon is committed to helping people of all ages to develop their tennis and athletic skills in energetic and fun lessons. Her lesson rate is £25 an hour. James has been part of the Beckenham Sports Club since he was a Junior player. Recently moving into the role of assisting with our Junior Programme, James is a Level 2 qualified coach and is studying to complete his Level 3. James is available for coaching at Beckenham. 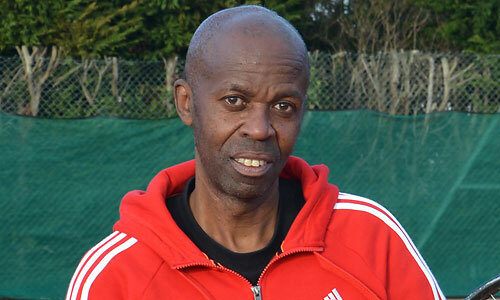 Tony is a Level 3 LTA Licensed Coach and has been a major part of Beckenham Sports Club for more than 20 years. Tony works with Juniors as well as leading the Saturday Beginners/Improvers sessions at Beckenham.